Push On- Push Off Button on back of flashlight. 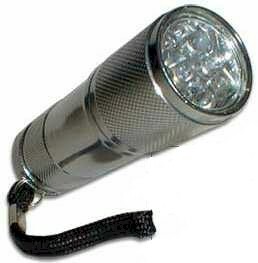 Description: These powerful Ultra Bright Flashlights are a must have for everyone! The LED Flashlights features 8 high quality light-emitting diodes ( LED ) which produces a very bright white light. The flashlight operates off AA batteries which are included. The Ultra Bright Flashlight comes in handy around your home, car, camping trips, hunting, and much more! Also makes a great gift! 10X longer battery life than standard flashlights!